I used to come to Fenton’s all the time with my basketball team growing up. We’d get 1 banana split and 5-6 spoons to share. I had been on a 10 year Fenton’s hiatus until the Pixar movie UP featured the ice cream parlor at the end of the movie. I ended up going to Fenton’s a week after seeing the movie. It is packed. Be prepared to wait at least 30 minutes to an hour to get a seat. The restaurant has an old soda fountain kind of feel with friendly staff and huge portions. There’s plenty of seating here, so it’s great for groups. I’ve learned my lesson. I will share a dessert next time I come here. The portions are ginormous! Greedy as I was, I got an ice cream soda while K got a brownie sundae. BIG mistake if you don’t want to feel utterly gross after eating. Don’t get me wrong, both were very delicious at first, but after eating 60% of my dessert after a Fried Chicken Sandwich from Bake Sale Betty’s, your stomach won’t be happy. Ice Cream Soda – This dessert comes with a large scoop of ice cream with sparkling soda water and syrup topped with whipped cream and a cherry. It took me a good 5 minutes to decide I wanted chocolate ice cream with chocolate syrup. I couldn’t think of a better combination! The fizzy water mixed with the chocolate ice cream and syrup was just like drinking what I imagine to be a chocolate soda from the 50s. 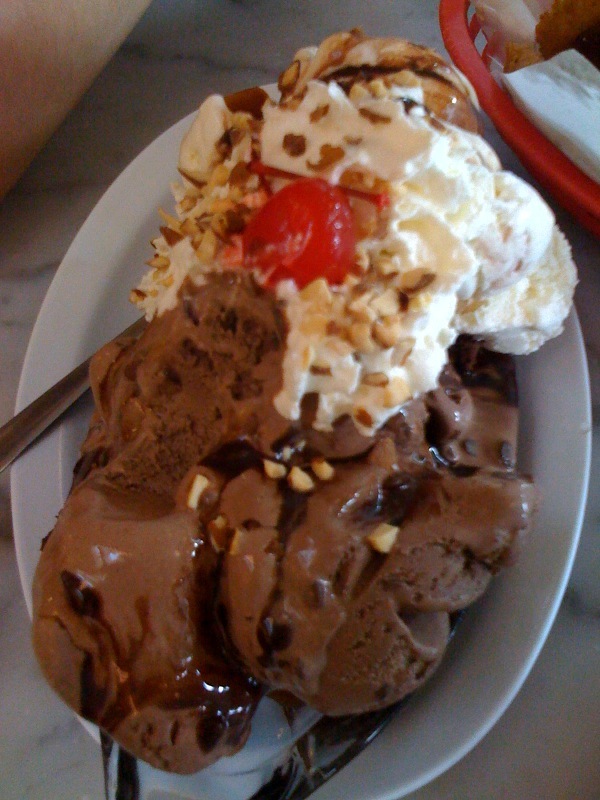 The Saddleback Brownie – A large warm and chewy brownie is topped with heaping scoops of vanilla and Dutch chocolate chip ice cream, hot fudge, whipped cream, almonds and a cherry. It was just as good as it sounds. Combined, we were only able to tackle half of this baby. Fenton’s is the place to go if you want to bring out the inner child over ridiculous amounts of ice cream. I’ll come back again when I make a trip out to the East Bay.